Top Reasons to Go to College. 1. Best Life Experiences. You will learn more about yourself and make friends that you probably will never forget. Going to college doesn’t only teach you about your career, but it is also a great place to learn how survive on your own for the first time. 2. Have a Better Career. Having a college degree will allow you to broaden your horizons, have more job opportunities and eventually get a higher salary. College allows you to focus on a career path that you are passionate about and pursue a job that you love. 3. Learn New Stuff. Along with gaining new exciting knowledge about your elected career, you will become more familiar with yourself. You will become more confident and a better rounded individual. 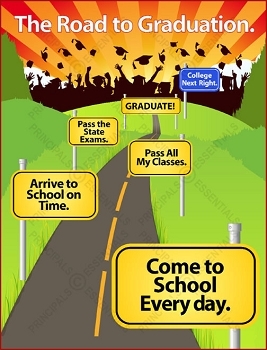 Encourage students to stay on the road to graduation. 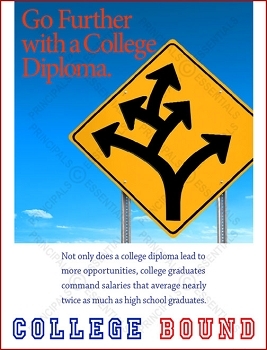 Go Further with a College Diploma. 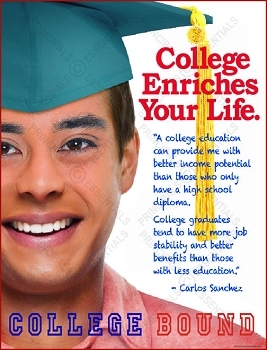 Help direct students to a college education and a higher salary. 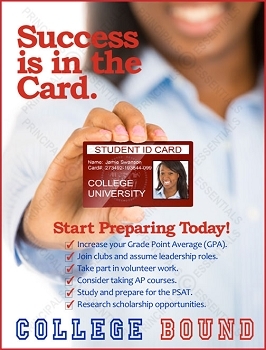 Early planning helps better prepare students for college. 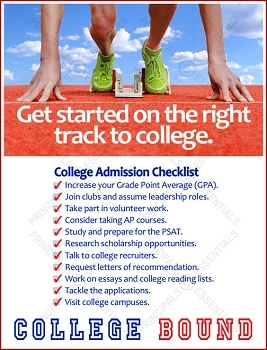 Get students started on the right track to college. Helps students make better college connections. 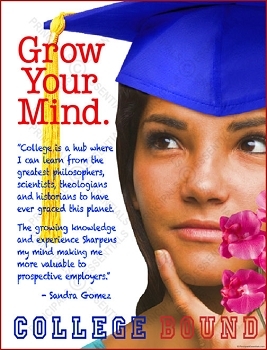 Plant the seed of a college education. 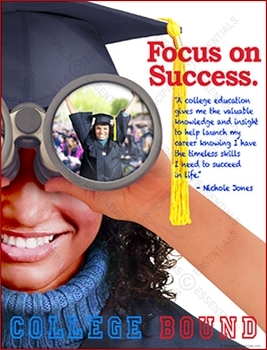 Help students focus their sight on a higher education. Students that graduate earn twice as much. 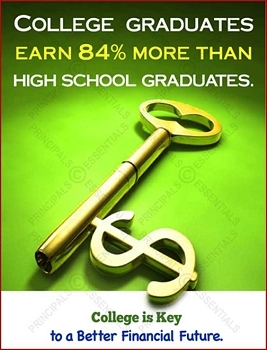 Give students the key to a better financial future. 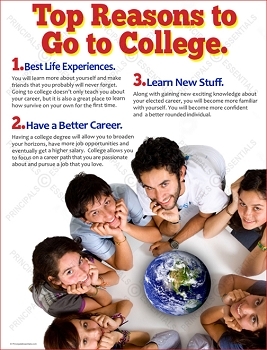 Give students 3 top reasons to go to college. 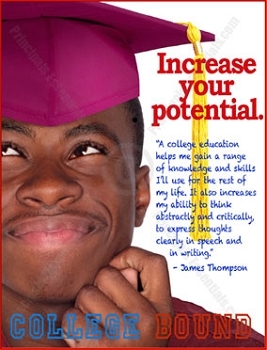 Encourage students to reach their full college potential. 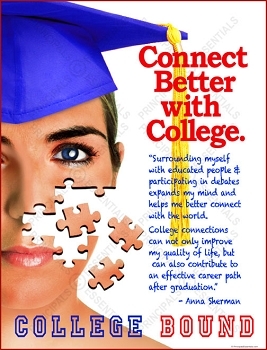 Help students solve the college preparation puzzle. 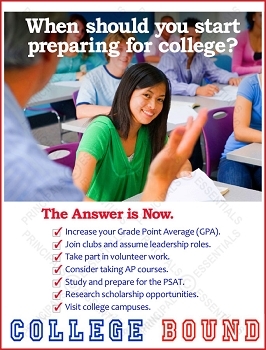 Encourage students to prepare early for college. Help students realize a wealth of opportunities. 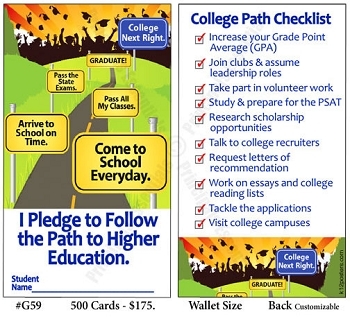 Help students better prepare for the road to college. Promote the best reasons to go to college in your school. 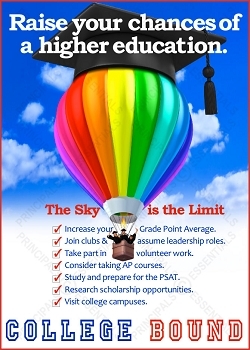 Point out the path to a higher education. Students commit to following the path to higher education. 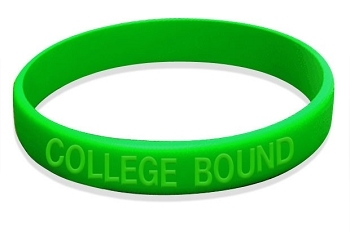 Students are asked to wear college wrist band. These students are holding their NEW college ID cards. Try our college motivation posters! Raise your chances of a higher education. 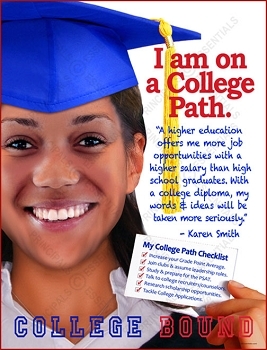 Raise student awareness about college readiness. 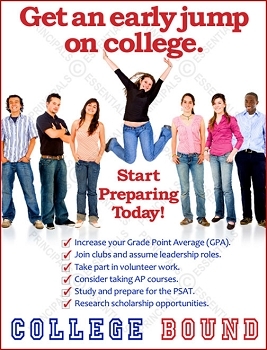 See our college ready posters! 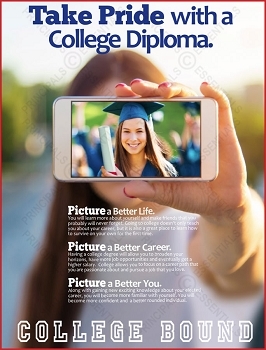 Picture Yourself with a College Diploma. Many renown people have mastered the technique of positive visualization and openly credit it as a success tactic. 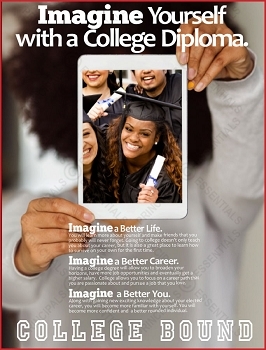 Imagine Yourself with a College Diploma. Top performers, like Michael Jordan, knew the importance of picturing themselves succeeding before they actually did it. 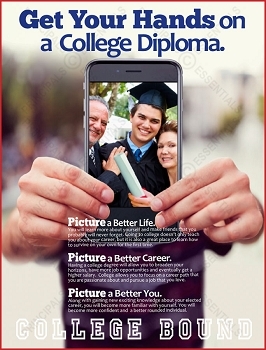 Take Pride with a College Diploma. A daily practice of visualizing your dreams as completed can accelerate your achievement of those goals. 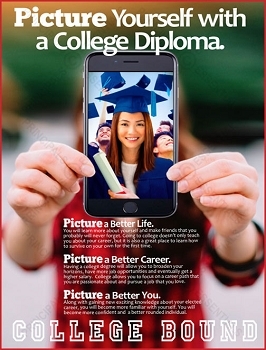 Get Your Hands on a College Diploma. Research suggests if you can't picture yourself being successful, chances are you never will. Help students visualize success. 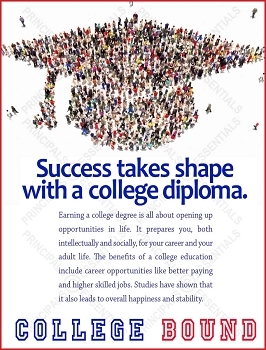 Success takes shape with a college diploma. 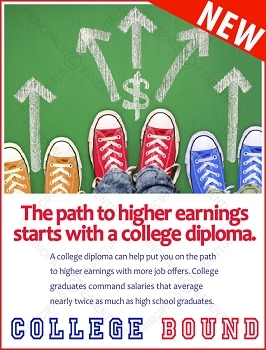 The benefits of a college education take shape when you earn a college diploma. 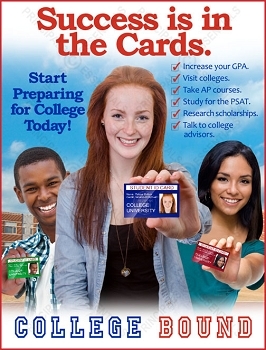 Help increase college enrollment in your school. 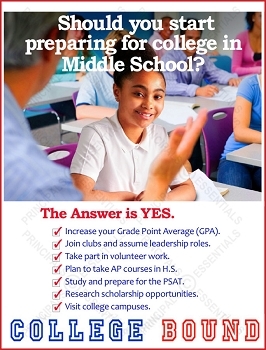 Early consideration helps Middle School students better prepare for college. 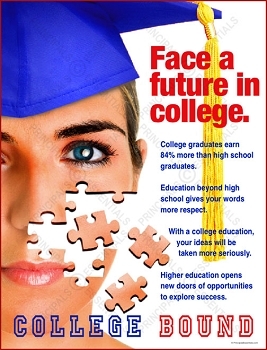 Help increase college enrollment! 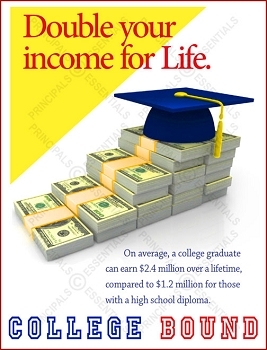 College graduates earn twice as much as H.S. graduates with more opportunities for employment.